J/News Articles: Italians Crowned SAILING Champions League Winners! 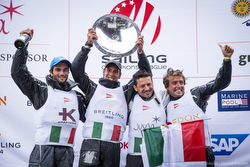 Italians Crowned SAILING Champions League Winners! 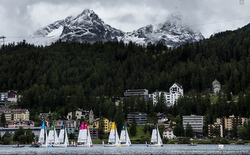 (St Moritz, Switzerland)- Four days of tense competition and a nail-biting final race on Lake St Moritz brought victory for the Italian team from Circolo Della Vela Bari (CVB) in the SAILING Champions League Final in St Moritz, Switzerland. The team from CVB claims the title ‘Best Sailing Club of the Year’. Runner-up is the Swiss club from Société Nautique de Genève ahead of Wassersport Verein Hemelingen from Germany who take the third place. 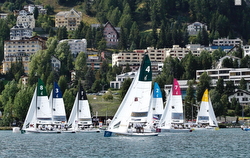 Thirty-one yacht clubs representing twelve nations came to St Moritz to fight for the prestigious silver trophy in the SAILING Champions League Final 2018. For the second consecutive year, the silver trophy of the SAILING Champions League stays in Italy. The CVB from the southeast coast of Italy takes over the title from their fellow Italians from Yacht Club Costa Smeralda. Three months after winning Semifinal 1 of SAILING Champions League in Porto Cervo, Simone Ferrarese, Valerio Galati, Corrado Capece Minutolo and Leonardo Dinelli to claim the title. The Italians won in the most extraordinary showdown between the top four teams who qualified through to the four-boat final. After seven flights of eight-boat races, it was the Swiss team, Société Nautique de Genève, who came through qualification at the top of the leaderboard. If the Swiss could win the first race of the finals, the ‘first-to-two-wins’ format for this competition would have made them the champions. In a very light-airs final race, it looked like the Swiss would indeed close out the regatta. The Germans, Norddeutscher Regatta Verein and Wassersport Verein Hemelingen, were parked on the far side of the final run and it looked like the regatta was slipping away. But, a small gust from behind wafted the Italians past the Germans and the Swiss. As they crossed the finish line, all four boats were overlapped but CVB won the race by only one meter, and the SAILING Champions League 2018 after adding up the points. The light-airs conditions came in strong contrast to the two semifinals that took place earlier in the summer. Porto Cervo produced moderate winds in Sardinia, while St Petersburg produced some all-out planing conditions on the Neva River, with winds gusting up to 30 knots. St Moritz was a much more subtle challenge. While day one produced perfect breezes under bright blue skies, the next three days of lighter wind demanded smooth boathandling and roll-tacking in the sub-5 knot conditions. The host city of St Moritz worked closely with the hosting club of Sailing Club St. Moritz and the region Graubünden to make sure that this gathering of international talent was given a world-class reception, with lavish parties in the evening and a great opportunity for all the international crews to get to know each other better.